In Montana, real property can be transferred from one party to another by executing a special warranty deed. This type of deed is commonly used in commercial transactions, but is also valid for residential transfers. 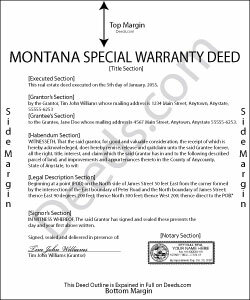 Special warranty deeds are not statutory in Montana, but are still accepted forms of conveyance. The state provides a general form that may be used for a special warranty deed (Mont. Code Ann. 70-20-103). The warranties included in this type of deed are not defined by statute, except for covenants implied by the use of the word "grant." The word "grant" implies that, prior to the execution of the conveyance, the grantor did not convey the same estate or any right, title, or interest to any person other than the grantee. It also implies that, at the time of execution of the conveyance, the estate was free from encumbrances done, made, or suffered by the grantor or any person claiming under the grantor (Mont. Code Ann. 70-20-304). A lawful special warranty deed includes the grantor's full name, mailing address, and marital status, and the grantee's full name, mailing address, marital status, and vesting. Vesting describes how the grantee holds title to the property. Generally, real property is owned in either sole ownership or in co-ownership. For Montana residential property, the primary methods for holding title are tenancy in common and joint tenancy. A grant of ownership of real estate to two or more persons is presumed to create a tenancy in common, unless a joint tenancy is specifically created (Mont. Code Ann. 70-1-307, 70-1-314). As with any conveyance of realty, a special warranty deed requires a complete legal description of the parcel. Recite the prior deed reference to maintain a clear chain of title, and detail any restrictions associated with the property. The deed should meet all state and county standards of form and content for recorded documents. Any party transferring real property is required to file a Realty Transfer Certificate, subject to a $500 penalty. File the form with the clerk and recorder in the county where the property is located. (Mont. Code Ann. 15-7-305). The Realty Transfer Certificate includes a Water Rights Disclosure. Contact the Montana Department of Revenue with questions regarding the transfer, division, or exemption of water rights. For a valid transfer, record the deed at the clerk and recorder's office in the county where the property is located. Contact the same office to confirm accepted forms of payment. This article is provided for informational purposes only and is not a substitute for legal advice. Contact an attorney with questions about special warranty deeds or for any issues related to transfers of real property in Montana. Robert H. said: I have used the quit claim form and seem is very easy. Reply from Staff: Thank you Robert, have an awesome day! Bernadette G. said: I LOVE that very concise directions and a sample completed deed were included. They were incredibly helpful. I did like the quick response to questions and the refund of my purchase when they were unable to find a deed I needed. I wasn't sure if I could trust this site, but my deed transfer went through without a hitch with the paperwork that was provided/purchased. Diana H. said: little expensive same document in other county is free. however quite fast in responding. and just what i needed.